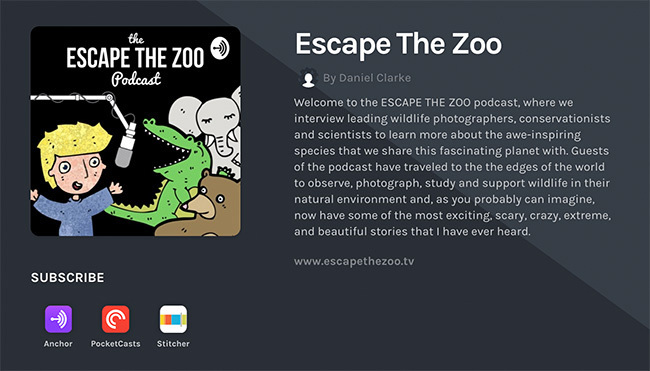 The newly launched Escape the Zoo podcast has just put up its inaugural episode, featuring me...rambling. Daniel Clarke, the person responsible for subjecting the Internet to nearly two hours of me, contacted me a few months ago about the podcast. I receive a fair share of emails asking for interviews and such. I wish I had time to reply to most, but there simply aren't enough hours in a day or days in a year to do so. Daniel's initial email was nice, polite, succinct yet detailed, grammatically correct, and clear about his background, rationale, and the specifics of his request. You'd think that would be a given for any request/ enquiry, but sadly, it is more often than not, not. Anyway, as a result, I replied, we exchanged a few messages, and we arranged a time to talk. This podcast episode is the result. Our chat was unscripted. For most interviews, I specifically ask that I not know in advance what I'm going to be asked. I generally think and communicate better without a script. Incidentally, I never write out text for talks either. I just get up and wing-it (with background factual prep of course), often surprising myself with what comes out of my mouth! Over the course of our discussion, Daniel asked me to relate some particularly memorable encounters, which I expected he'd do. But more importantly, we touched on issues of context, challenges facing the world—including obvious environmental issues but also topics relating to human behaviour. In listening through the final audio, I could tell where I held back a bit here and there, but generally, I spoke my mind. If you're so inclined, you can listen to the audio online here: Escape The Zoo, or via the embed below. If you do listen all the way through, there's one footnote I should add. I flubbed a research reference toward the end of our discussion, when we were talking about the effects of human-generated sound pollution on cetaceans. I was thinking of two different pieces of research I had read, and mixed them up in my head. I fused half of one research outcome with one half of another. Doh. Bad Tony. Bad, bad Tony. Luckily, my brain was still clued-in enough to kind of know there was something not quite right when I was talking, so after we got off the line, I dug up the relevant research and figure out my mistake. I sent the information over to Daniel, so the information that he links on his shownotes is correct. Please forgive my brain fog. Oh btw, I should've had a better microphone. I had one before, but I don't have any idea where it went, so I only had the standard-issue Apple earbuds (which are no longer standard issue b/c wires are apparently so passé). I sound somewhat muffled. That's on me, it's not Daniel's audio engineer. Daniel's mission is to interview more people who are out in the world doing interesting things, so please do not hold his choice for his first episode against him. I understand that he will be posting more interviews soon. Visit Daniel's website to get more information.